Some fifty people prayed the Rosary, offered public reparation and protested against the “P*** Christ” blasphemy on its opening day of its showing. The protest was held in front of the Edward Tyler Nahem Art Gallery on 57th Street in New York City on September 27. It was organized by the American Society for the Defense of Tradition, Family and Property and its America Needs Fatima campaign. Despite the fact that over fifty people were present on the opening day of the exhibit, the media took absolutely no notice. 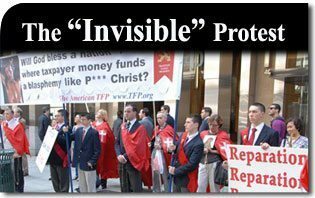 The protest was totally invisible to them. Not a word. Not a picture. Nothing. They could not see fifty people praying in a very public place about a very controversial issue. Despite the scaffolding around the art gallery, most of the protesters stood directly in front of the gallery and peacefully protested the work. Many passersby were sympathetic to the act of reparation and were disgusted to learn that a crucifix in a jar of urine was on display in the art gallery and that it was even being called a work of art. 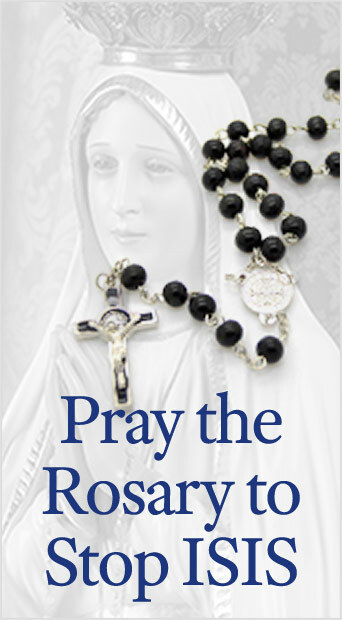 May the Blessed Virgin Mary hear these prayers and accept these acts of reparation and intercede with Her Divine Son, Our Lord, to bring an end to the terrible wave of blasphemies that afflicts America. 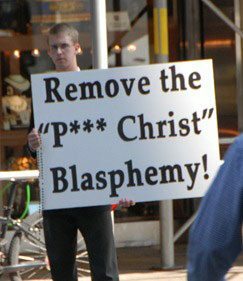 This entry was posted in Anti-Blasphemy and tagged America, anti, Art Gallery, blasphemy, Christ, city, crucifix, Divine, Edward Tyler Nahem, Lord, New York, protest, public, reparation, TFP by The American TFP. Bookmark the permalink.